I wanted to get a few cards made today, but so far this is my one accomplishment. If I had to get just one done, this one turned out pretty cute. 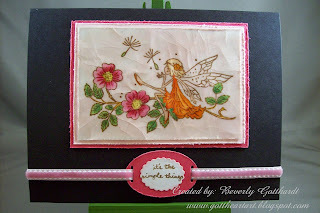 This is one of my new Lili of the Valley stamps, for some reason I'm kind of picky about the kind of fairy stamps I like. I really like these, I have won a couple of digi fairies that I like and then there are the Stamping Bella fairies. Fairies are kind of growing on me since I started doing the Flutter By Wednesday Challenges. This is the cracked glass technique on the fairy image. ABC Challenge has started a new once a month technique challenge and this is the first one for February. Saturday Spotlight SSHP17-Teeny Tiny Time! Supplies: Black Card Blank 5" X 6 1/2" Halcraft, Papers: Stampin Up, Stamps: Lili of the Valley, Clearly Wordsworth-Tiny Wise Words, Ink: Ranger Archival Ink: Coffee, VersaMark Ink Pad, Ranger Distress Ink-aged mahogany, Stampin Up-Clear Embossing Powder, Chartpak-water color wheel, PrismaColor pen-brick beige, Copic Ciao marker-E51, Cuttlebug die-slider tag, Spellbinders Nestabilities-Classic Scallop Oval Lg. , ribbon-Offray, Spica glitter pen-clear. This is adorable - love the cracked glass technique here! thanks for playing with the 411 this week! I love doing the cracked glass technique. You've done an amazing job with this. oh this is so pretty! I love the image you chose and your coloring. Just perfect! LOVE the cracked glass technique ... thanks for inspiration, I haven't done that one is a long time! Thanks for joining us at Saturday Spotlight! We do hope you'll come back next week for more fun!! Very cute...thanks for playing along with Stamping 411 this week! Hey, even making one card a day is a good day!!!! Especially, when the card is as beautiful as this one!! This is such a sweet fairy and design! Very colorful and I like the cracked glass technique. Thanks for joining us at the Sat. Spotlight and Flutterby Wednesday this week! Very pretty!!! Thanks for playing along with us this week over at Stamping 411! !